The New York Times described Abbas as “visibly enraged” when he spoke to the General Assembly. “The Palestinians will not return to any negotiations that do not take as a starting point the final objective of a Palestinian state to stand alongside Israel, based on the ’67 borders, and a binding timetable for its establishment”. Hass points to words in the speech that sounded more like a prosecutor addressing a jury determined to prove to that jury, the guilt of the accused. The last time an angry Palestinian leader addressed the UN was on November 13, 1974, when PLO leader Yasir Arafat came to the General Assembly podium carrying a gun in one hand and an olive branch in the other. It was the first time a Palestinian leader had been invited to speak to the UN body. Neff described Arafat’s presence as a “watershed for the Palestinian community”. Neff’s report ran in the November/December 1994, edition of the Washington Report on Middle East Affairs, twenty years after Arafat’s speech and twenty years before Abbas’s “visibly angry” address. Neff’s report is an indication of how little has changed in the colonial scenario in which the United States stands watch over, and finances, Israel’s illegal takeover of Palestinian lives and land. “The difference between the revolutionary and the terrorist lies in the reason for which each fights. Whoever stands by a just cause and fights for liberation from invaders and colonialists cannot be called terrorist. Those who wage war to occupy, colonize and oppress other people are the terrorists…. In the Abbas speech of 2014, the Palestinian leader has moved far beyond Arafat’s proffered choice between a gun and an olive branch, which were in 1974, metaphors that the aging revolutionary used to warn the West of what the future would bring. Abbas is currently the president of a Palestinian state with a government led by the united political factions of Hamas and Fatah. Those factions have much work ahead to form “a more perfect union”. The most important thing they hold in their new wobbly unity is the ability to present Israel to the ICC, the International Criminal Court where Israel’s conduct as an occupying force can be tried on criminal charges in a world court. Israel and the United States know that the ability of Abbas to join the ICC will change the dynamics between Israel and Palestine, allowing Palestine, for the first time, to stand on equal footing with Israel before a court, seeking justice. In spite of knowing this, the best Israel and the United States could do this time around, following Abbas’ UN message to the west, was to cry that the speech was “offensive” (the U.S., of course, in its best State Department whimper) or to attack the speech as filled with “lies” (the standard Israeli response to any criticism). [Abbas] did not offer his own deadline for an Israeli withdrawal, as some had expected, nor did he say anything about joining the International Criminal Court, which his aides have repeatedly said he is prepared to do. He only hinted that he would seek accountability for alleged war crimes against Palestinians during the latest war with Israel. Why should he play those cards now? Thanks in part to Israel’s carnage in this summer’s Gaza invasion, and what that invasion showed Israel was capable of doing to a captive population, world sympathy is slowly shifting. Abbas now holds two important cards, joining the ICC and allowing other nations to bring charges against Israel for its “alleged” war crimes. Why play those cards now? There will be time to hold them as a threat to Israel as the rest of the world slowly stirs itself and sees the reality of Israel’s occupation. 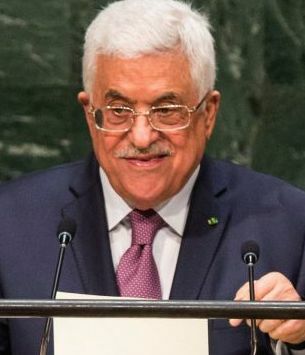 In her analysis of the Abbas speech, Amira Hass takes note of the fact that the man who spoke to the General Assembly Friday is a changed man from his days as a leader who tried to trust Israel and the United States. A wide gulf divides the speaker who on Friday said Palestinians “will not forget or forgive and won’t let war criminals go unpunished” and the one who in 2010 blocked the passage of the Goldstone report – which investigated allegations of war crimes committed by Israel and the Palestinians during “Operation Cast Lead” – to the hands of the UN Security Council. The next two years are crucial. President Obama may be the last American president in the next decade, from either party, with the experience and the moxie, to force a right wing government of Israel to recognize that the ICC is a legal body with the power to wound wrong-doers. A legal body, that is, that is not subservient to the Israel Lobby. That Lobby, of course, will continue to throw road blocks in the path Palestine takes to the ICC. For a detailed study of that process and the chances of a successful landing by Palestine vs. Israel in the ICC, see this Link essay by John B. Quigley. The journey to the ICC is complicated, as are all things in this Israeli-dominated region. But making the journey at a time of Palestine’s choosing should keep Israel from an early return to periodically “mowing the grass”, in Gaza, as Israelis have obscenely described these invasions. Only the dumbest politicians keep committing their crimes with a set of indictments hanging over their collective heads. Play that ICC card, President Abbas, at a time of your own choosing. The picture of President Abbas above is from AFP. It appeared in Haaretz. This entry was posted in Middle East, Middle East Politics, Netanyahu, Obama, USA, War. Bookmark the permalink. Jim, you did a great job in summing up the dilemma. There is no way to have 2 states any longer. Israel has absolutely mutilated this option, and the US administration succumbs to Israeli dictates. The “united” Palestinian leadership ought to focus on bringing Israel to the ICC (International Criminal Court) without delay, while people around the world still remember Gaza 2014..
No matter how complicated and difficult because of obstructions by the two Zionist states, the focus on bringing the terrorist state of Israel to justice, at the World Court, will change paradigms around the world. It will be a mistake to give Israel “Luxury time” to plan more deceptions and prepare more obstacles and traps. It is time for Abbas to take the initiative today, not tomorrow. At last Palestine has a unified government. It has been suggested that President Abbas should call for Hamas to be taken off the US State Department’s list of terrorist organizations. I am a skeptic; heard it all before. Words, words…. Abbas will only bring credibility to legitimate Palestinian claims when he stops talking and starts acting. Excellent news Jim. This is by far the most outspoken President Abbas has been on behalf of the Palestinian cause in recent years. It may well derive from the most recent invasion of Gaza by Israel and the determination shown by Hamas not to be subdued by overwhelming Israeli military force. The most crucial factor now is for the Palestinians to build a strong and united leadership based on the new Unity government in which political factions from both Fatah and Hamas are represented. And not to allow Israel and the West to refuse to deal with such a government because of the presence of Hamas, which for too long has been demonised as a “terrorist” organisation.